Tom and Betty Neal of Gallatin were recently awarded the Tennessee Board of Regents Chancellor’s Award for Excellence in Philanthropy. The award honors those who have made great and lasting contributions to the state’s colleges and universities. The couple began funding a scholarship at Volunteer State Community College in 2000. They were involved with special fundraising events, such as the Harvest Moon Soiree and Educate a Woman luncheon. Along with being active supporters of Vol State, Mr. and Mrs. Neal have also been strong supporters of Tennessee Technological University. The presentation of the Chancellor’s Award was made at the annual Hal R. Ramer Dinner by the Volunteer State College Foundation. Pictured: The presentation of the award at Vol State. 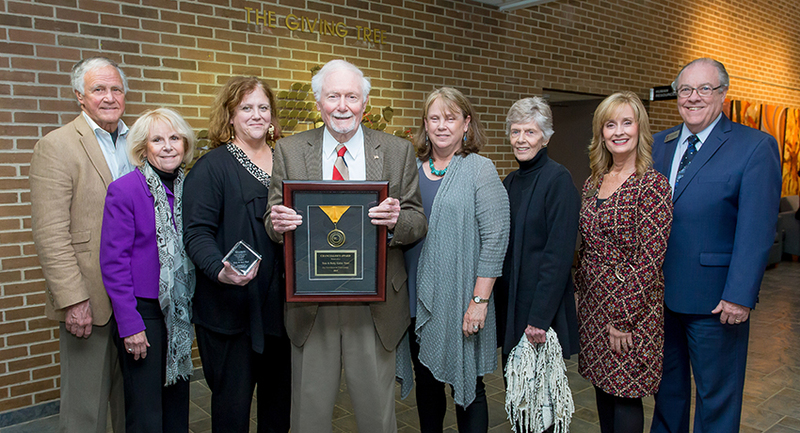 Left to right: Paul Neal, Pat Highers, Lisa Neal, Tom Neal, Karen Neal, Mary Belle Ginanni; Karen Mitchell, executive director of the College Foundation; and Jerry Faulkner, Vol State president.